Such comparator should return a positive value if first String has a length greater than second String, a negative value if the length of first String is less than the length of second String and zero if both String has the same length. You can define such one-off Comparator by using Anonymous inner class as shown in this article and further use it to sort a list of String on their length. This is a very useful technique and works fine in Java 6 and 7 but works fantastically well in Java 8 due to less clutter provided by the brand new feature called lambda expressions. Here are a and b are two String object. This Integer.compare() is a new method added to Java 8. Since we are using Comparator of String, the compiler is also smart enough to infer the types of a and b, which is, of course, String. If you are interested, please see Java 8 New Features in Simple Way to learn more about new methods added on Comparator class and several other Java 8 features which can make your day-to-day life easy. Here is an example of using this String length comparator to sort a list of String by their length. In this program, we have demonstrated both JDK 6 and 7 way by using Anonymous class and new Java 8 way by using lambda expressions. You can see that the Java 8 way takes just one line and it's a lot easier to understand once you get familiar with the syntax of lambda expressions. If you want to learn more about lambda expression and other useful Java SE 8 features, I also suggest you join The Complete Java MasterClass which will teach you not why and how to use lambda expressions in Java 8. Now, let's see how you can compare String by their length in pre-Java 8 world, I mean with Java 6 and Java 7 versions. 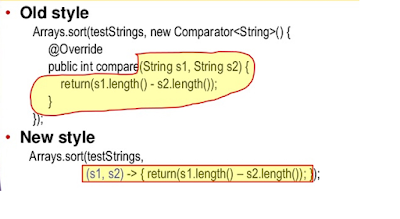 That's all about how to compare String by their length and how you can sort a list of String by their length in Java 7 and Java 8. You can see it a lot more convenient in Java 8 as you can create custom Comparator in just one line by using the lambda expression. The JDK 8 API is full of such methods to facilitate even more complex comparison like by using the thenComparing() method you can chain multiple comparators. 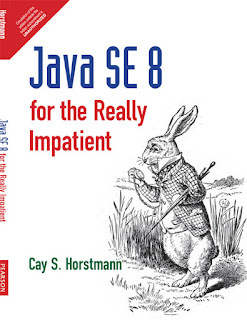 See Java SE 8 for Really Impatient for more illustrated example of Comparator in Java 8.